WASHINGTON (CNS) — There’s little, if anything, that immigrant advocates like in the Trump administration’s latest immigration plan. The 70-point Immigration Principles and Policies was sent to Congress Oct. 8. The wide-ranging document calls for a major tightening of immigration laws; raising the standard of proof for asylum seekers; and limiting family members of current immigrants who can enter the country. Other provisions include constructing a wall on the southern border; a crackdown on the entry of young Central Americans; criminalizing the overstay of a visa as a misdemeanor; and restricting federal grants to so-called sanctuary cities. To top it off, White House aides told reporters that they expect Congress to include the entire plan in any immigration-related legislation being considered. If that’s the case, it endangers a deal Trump made with Democratic congressional leaders to allow an estimated 800,000 younger immigrants known as “Dreamers” to remain in the country legally. Democrats said they cannot support the plan as submitted if it is tied to the legal status of the “Dreamers,” the beneficiaries of the Deferred Action for Childhood Arrivals program, or DACA. Immigrant advocates aren’t accepting it either. Several described the principles as “immoral” and said they disrespect basic human dignity. “It’s basically a nativist immigration agenda. It’s everything but the kitchen sink that they want in this administration,” said Kevin Appleby, director of international migration policy at the Center for Migration Studies. “This plan is all about cracking down on immigration and how immigrants are keeping America from becoming what it could be. Cracking down on immigrants is not the direction we want to go in,” said William Canny, executive director of Migration and Refugee Services of the U.S. Conference of Catholic Bishops. “The whole thing is to just basically say there’s white America and we’re losing our identity and we have to keep people out. That’s certainly not America. That’s certainly not Catholic,” said Mark Ensalaco, director of research at the University of Dayton’s Human Rights Center. 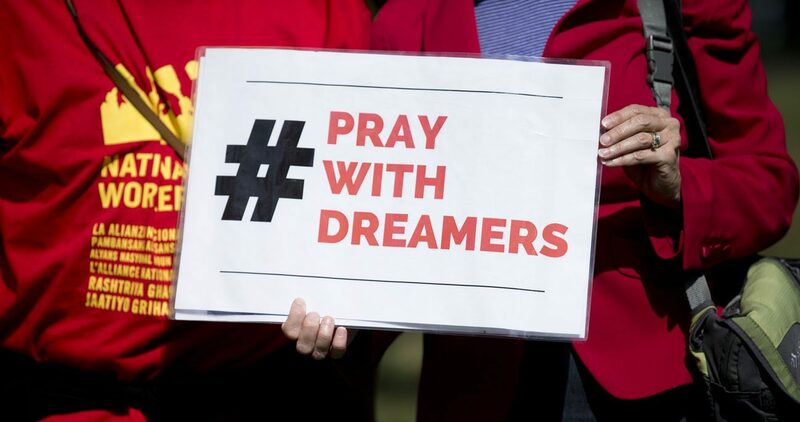 Using those covered by DACA as a bargaining chip to gain backing for strict immigration policies raises moral questions for the advocates, among them the Catholic Legal Immigration Network, known as CLINIC, and Bishop Joe S. Vasquez of Austin, Texas, chairman of the U.S. bishops’ Committee on Migration. While congressional Democrats dismissed the White House principles outright, Republican leaders have largely remained silent, with some saying only that they would study the plan as part of their efforts to review immigration law. The Wall Street Journal reported in April that not a single member of Congress who represents districts on the southwest border said they supported funding to begin wall construction. It’s the Dreamers who remain the primary concern of the advocates, and putting them “front and center in the negotiations … is not something we support,” Canny said. The Trump administration announced Sept. 5 it was ending DACA. The Obama-era DACA program allowed young people brought to the country as minors to receive a renewable two-year period of deferred action from deportation and get a work permit. Trump held out hope for younger immigrants, who know the U.S. as their only home, by striking a deal with congressional Democrats that would allow Dreamers to remain in the country. Democrats said there were no strings attached to the agreement and were alarmed when the White House plan became public. In a separate announcement earlier, Trump set the number of refugees the country would accept during fiscal year 2018 at 45,000. It would be the lowest level for persons fleeing persecution being accepted since the Refugee Act that allowed the executive branch to set the caps became law in 1980. Appleby acknowledged that enforcement of immigration law “is part of the solution, no doubt,” but that the new principles represent a harsh stance unseen for years. Only through bipartisanship will a human solution be reached, Canny added. The advocates planned to mobilize parishioners to tell Congress that the White House principles fail to respect human dignity. Lucas Swanepoel, senior director of government affairs at Catholic Charities USA, said a long-term strategy is needed to emphasize the negative effects of strict immigration policies on the lives of families if the country is ever going to resolve the issue. “We have to be telling the stories of the people impacted at the local, getting parishes engaged, local agencies engaged,” he told Catholic News Service. The worldwide Share the Journey campaign can help, he and others said. The Share the Journey campaign is a two-year initiative of Caritas Internationalis, the global network of Catholic charitable agencies. Backed by Pope Francis, it is meant to urge Catholics to understand and get to know refugees and migrants and become their advocates. It follows in the path of the long leadership role the church has exercised on behalf of migrating people, Swanepoel said. Well, of course . . . the Church wants more souls, preferably poor, to fill its pews, and is indifferent to the damage immigration has done to the American middle class. It’s time for the Church to lose its tax exempt status.